Have you heard the sound of raindrops on calm water? It has a soothing effect on the soul, and when you add the sound of kayak paddles gently dipping and purple martins twittering above, one gets a sense that all is right with the world. I crave these sounds, which is why I’ve been a kayak guide for 20 years on the Kitsap Peninsula. Rain in the forecast doesn’t have to keep you from getting out on the water! 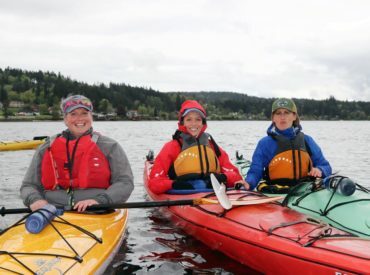 While I encourage paddlers who sign up for my trips to be prepared with proper clothing, I also urge them to get excited for the beautiful experience they’re about to have. Though it rained off and on for my Women On Water (WOW) kayak trip on April 28 on Poulsbo’s Liberty Bay, some version of, “paddling in the rain really IS amazing!” came out of everyone’s mouth at some point. To begin, the seven of us gathered under the awning of the Poulsbo Marine Science Center so we could get to know each other without getting rained on. By the time we ventured onto the Olympic Outdoor Center kayak rental dock next door, the rain had almost stopped. There, we put on our spray skirts and personal flotation devices for safety and warmth, then practiced paddle strokes and fitted our kayaks before heading onto the water. Though it rained off and on over our three hours on the water, we, paddlers, weren’t disappointed. Throughout the day, I felt a sense of calm wash over all of us. As we gathered together on the glassy water in our rainbow of kayaks, a mizzle (fun word for a very light rain) tinkled on the glassy water around us. We practiced our strokes — forward, sweep, brakes — then oohed and aahed at the great blue heron that surprisingly stayed put as we paddled through the narrow passage next to its fishing spot. 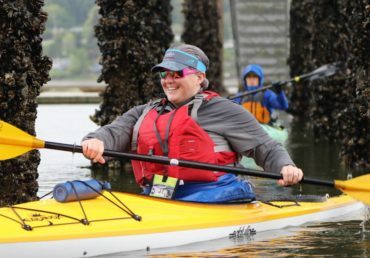 At first, we paddled on the shallow water along the shore in search of local residents: crabs, moon snails and the colony of California sea cucumbers I’ve seen in my summers of paddling. We didn’t find moon snails or the sea cucumbers, but curiosity was piqued. On our way, everyone took me up on the challenge of paddling through a row of pilings, and only a few mussels were knocked off in the process. 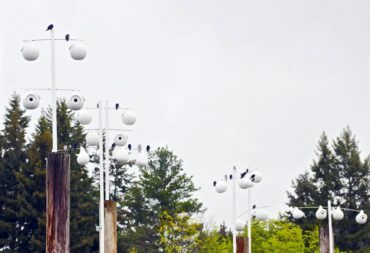 Between marinas, we took a few moments to marvel at the purple martin housing complex. The chirps and twitters of these large, shimmering, purple-black swallows swirled around us as they dove and chased each other, dipped into and out of their white gourd-shaped houses. They brought us hope that their declining numbers will continue to grow with housing projects such as these. We then stopped for an on-water chocolate and water break, during which we marveled at our luck with the wonderful weather. The rain was so light, we couldn’t feel it through our rain jackets, hats and spray skirts, and the water was glassy due to a complete lack of wind — a sea kayaker’s paradise. On our way to our lunch destination at the Keyport Mercantile and Diner, a harbor seal popped up to check us out as we laughed and rhythmically dipped our paddles. It was pure peace. At the diner, we found all the small-town charm and joy that I come here for, along with delicious sandwiches, chili, ice cream, and, for some, beer. Some beer drinkers were novice paddlers, showing how comfortable they had gotten with paddling already (nope, no one tipped on the way back!). While I was deciding on which sandwich to get, an elderly woman with a giant smile made her way toward the cashier and me. “Well, here comes trouble!” the cashier boomed. 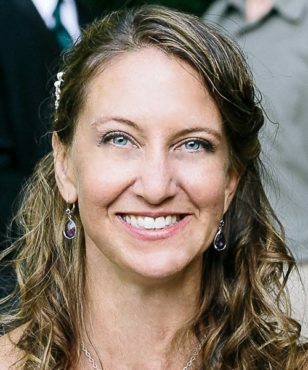 Her smile grew even larger, and she pulled out a photo of the very street we were standing on, covered in snow in a snowstorm in the 1990s. She tottered around the store showing everyone before hollering, “See y’all later!” as she stepped back outside. The way back was as magical as the way there. Even with a tiny bit of wind, the wide-open bay was dreamy with its loons and great company, and lack of speedboats. As we glided to the dock and stepped out of our kayaks, it felt as if all the stresses of life had drained out of us. For me, it had been replaced by a sense of peace, joy, inner calm and gratitude. 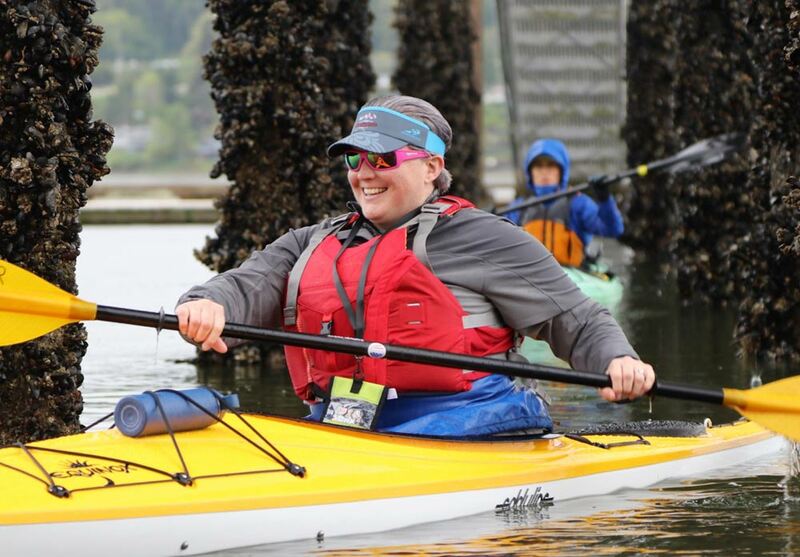 I’m so grateful to all those who have joined me and supported me to make these WOW trips happen, and to myself for following my heart to start kayaking in the first place. I offer a deep thank you to the Olympic Outdoor Center for their unwavering support of me and my (sometimes wild) kayak program ideas throughout the years. 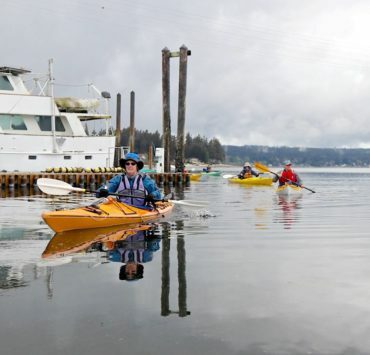 To learn more about the WOW and other kayak trips, classes and summer camps, visit www.OlympicOutdoorCenter.com.